Every spring we wonder where the Downtown peregrines will choose to nest. In the past seven years Dori has chosen Third Avenue four times, Gulf Tower twice, and once an alcove at the former Macy’s. She prefers Third Avenue even though the season ended badly there last year. This year we know Dori won’t be using the Gulf Tower nestbox. The building’s pyramid roof and exterior walls need critical maintenance and work is already underway. 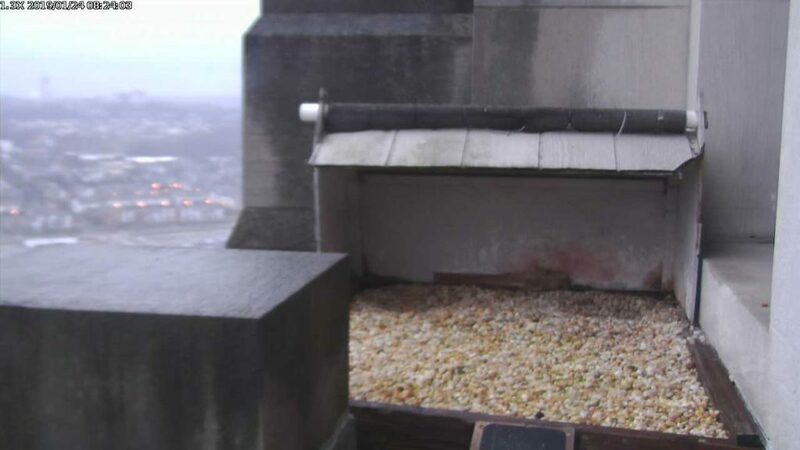 Rather than risk a failed peregrine nest attempt, the nestbox was removed yesterday in hopes that Dori will choose another site, which she’s likely to do anyway. To give you an idea of the building’s dilemma, here’s what’s up. During a routine exterior inspection last summer significant problems were found on all sides of the building and on nearly every elevation. Worse yet, the top six stories — the pyramid tower — were found to be missing more than 85% of their mortar joints. The conditions are so severe that they require immediate remediation. 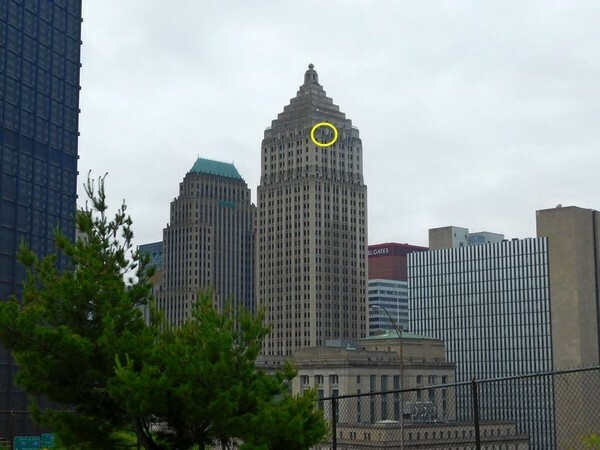 The photo below shows the Gulf Tower in 2017 with a yellow circle for the nestbox location. Peregrines don’t like to nest where humans are above the nesting zone. Because the work affects the peregrines, Gulf Tower management conferred with the Pennsylvania Game Commission who provided recommendations: initially (a) Don’t work during the nesting season blackout dates, Feb 15th to July31st, then (b) a variety of strategies to try to exclude and deter the birds prior to the onset of nesting season, such as removing the nest box. Given the masonry crisis there really wasn’t a choice. Remember when a 1,500 pound cornice fell from the Frick Building 18 months ago? Fortunately no one was hurt but the streets were closed for three weeks while crews constructed protective walls and encapsulated the damaged granite. Then repairs began. (Click here for WTAE video, here for P-G article.) Rugby Realty owns both the Frick Building and the Gulf Tower so they know exactly what can happen. They can’t afford to delay Gulf Tower repairs. So this year there’s no Gulf Tower nestbox and no falconcam. However building management plans to complete masonry repairs by the end of 2019 and reinstall the nestbox for the 2020 season. The falconcam will be back next year. For now we know where the Downtown peregrines won’t nest but not where they will nest. Dori is very creative. If she doesn’t choose Third Avenue I’ll be asking you to search for her just as we did in 2015. Ah nuts, this is sad news. Dori had just visited Gulf the other day. Praying that she finds a site that can be monitored, even if there is no camera.